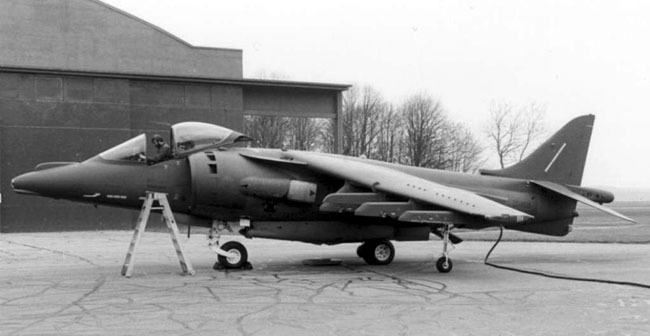 Following the success of the P.1127/Kestrel in demonstrating the viability of VTOL for a close support combat aircraft the type was ordered into production in mid 1966. Six development and 60 production aircraft were ordered. 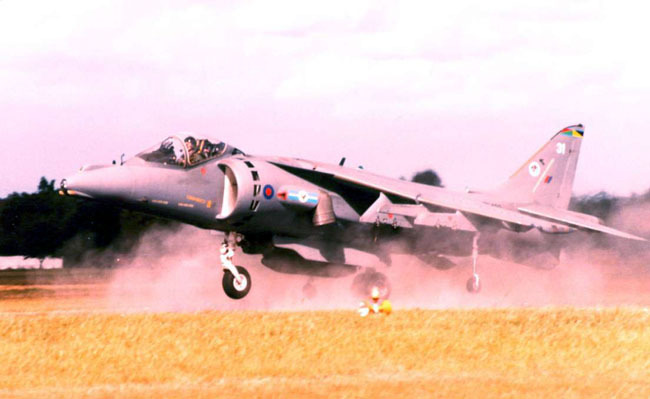 Whereas the Kestrel embodied about 50% of the structure of the P.1127, the Harrier was in many respects a new aircraft re-engineered around the more powerful Pegasus 101 engine. 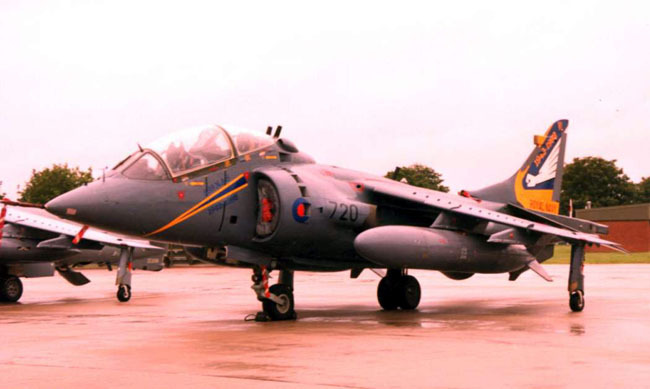 GR Mark 1 The P.1127/7 first flew on 31 August 1966 (XV276) and the first six development batch machines went to the manufacturer and Boscombe Down for intensive trials, development and weapons work. 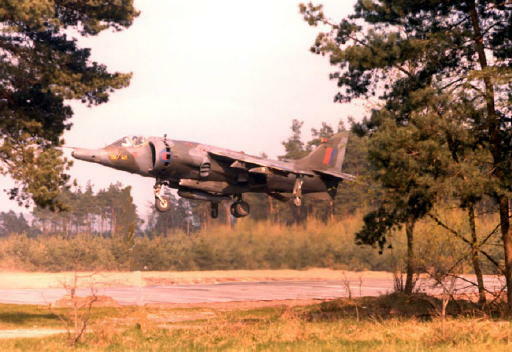 The first production aircraft (XV738) flew on 28 December 1967 and in January 1969 the Harrier Conversion Team was formed which in turn became the Conversion Unit at Wittering. 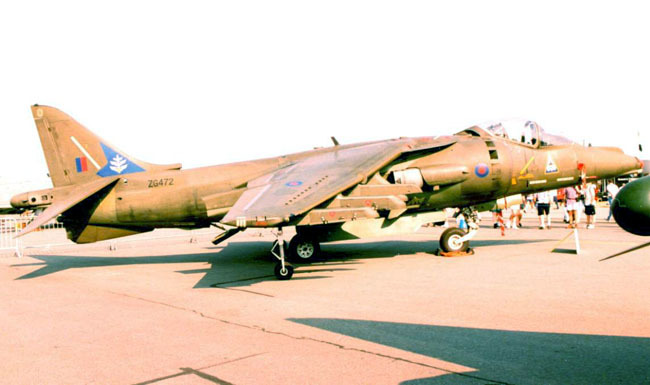 It was there that the first VTOL squadron in the world, appropriately No 1, was formed in July 1969. 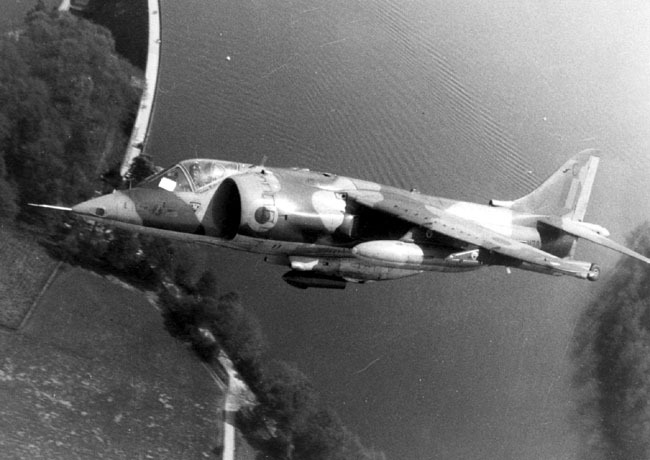 The GR Mk 1 was fitted with four underwing and one fuslage pylons to accommodate a total of 5,000lbs of bombs or rockets. In addition a pair of Aden 30mm cannon could be carried in detachable under-fuselage pods. GR Mark 1A Numerous GR Mk 1 aircraft were retro-fitted with the Pegasus 102 of 20,500 lbs thrust as the Mark 1A. T Mark 2 The trainer was a two-seat tandem variant with nose and tail extensions of 47ins and 33ins respectively. 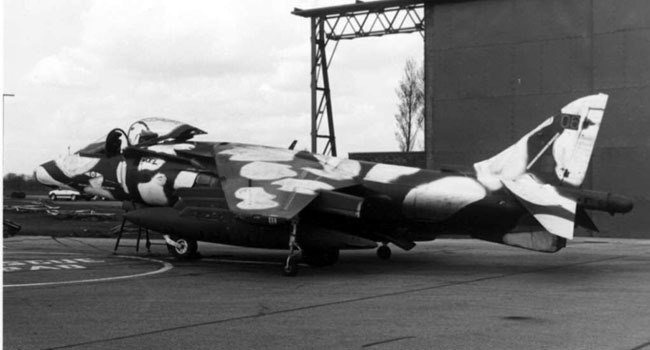 They were fitted with an extended under-fuselage strake and later in their service lives were given taller fins. The engine was the Pegasus 101 of the GR Mk 1. 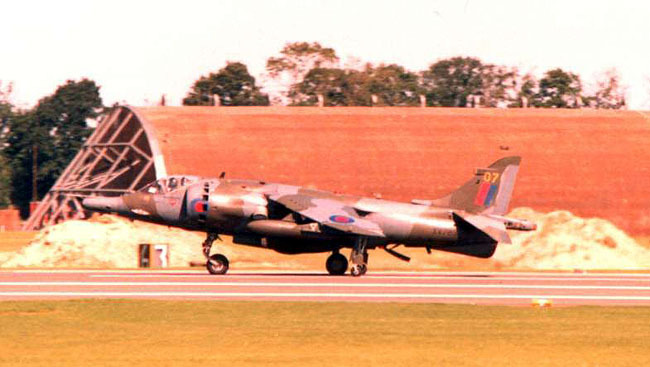 The prototype (XW174) flew on 24 April 1969 and the type was issued to squadrons as well as the OCU. T Mark 2A The Mark 2A designation was applied to eleven examples of the T Mk 2 fitted with the Pegasus 102 engine. Most were fitted with the taller fin. GR Mark 3 The Mark 3 was developed from the GR Mk 1. As additional aircraft were ordered to cope with attrition the number of changes from the original was sufficient to merit a new designation. The more powerful Pegasus 103 of 21,500 lbs thrust was fitted and other differences were connected with sensors. 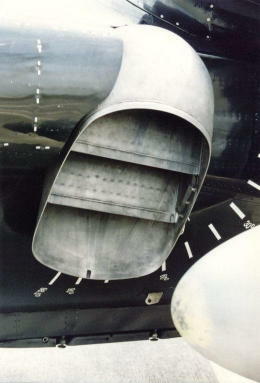 The Ferranti LRMTS target seeker and marker was installed in a revised nose and a passive warning receiver on the fin. 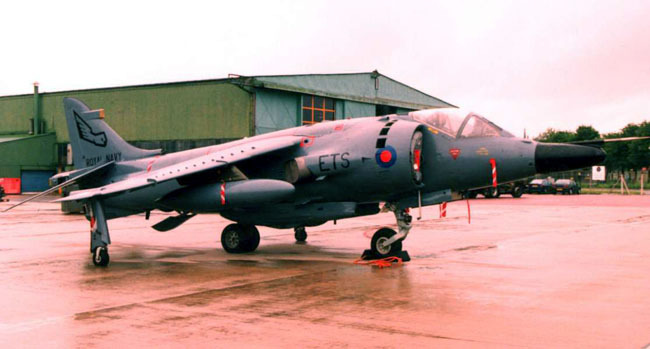 40 new build aircraft were constructed but most were GR Mk 1/1A aircraft upgraded as they required major servicing. Mark 4 Like the GR Mk 3, the Mark 4 was a redesignation given the number of changes to an earlier version, in this case the T Mk 2. The changes were similar to those embodied on the GR Mk 3 but the T Mk 4 reverted to the original, lower, fin of the early Mk 2. Like the Mk 2 the T Mk 4 was fully combat capable. T Mark 4A The Mark 4A was similar to the T Mk 4 but without the laser nose. The equipment was deleted to save weight, allowing increased range. 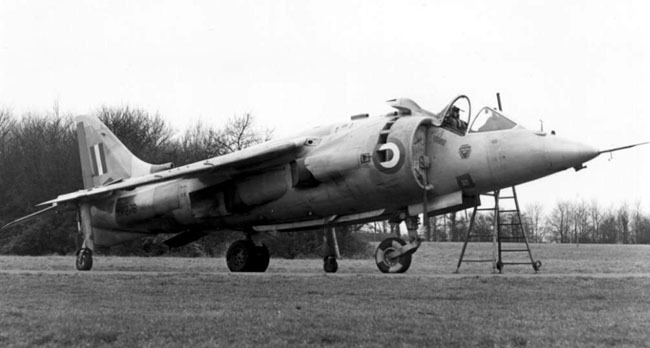 T Mark 4N The Mark 4N was built for the Royal Navy and was similar to the T Mk 4A but with the Pegasus 104 engine. GR Mark 5 The next variant was a major re-design sufficient to justify a new name let alone a new designation. 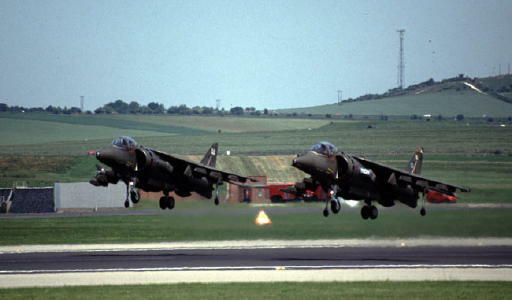 The new type was the result of USMC pressure for a more capable aircraft, building on experience with the early Harrier (AV-8A); McDonnell Douglas was contracted to work on the new type in 1978. 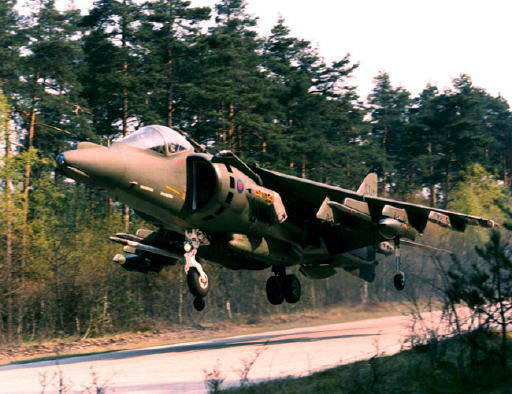 The RAF also required a developed aircraft and BAe designed the machine with a larger wing to specification ASR409. 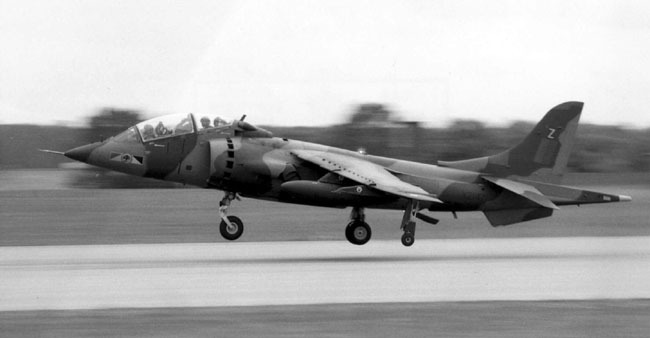 In the event in 1981 agreement was reached for a common type to become the AV-8B/GR-5. 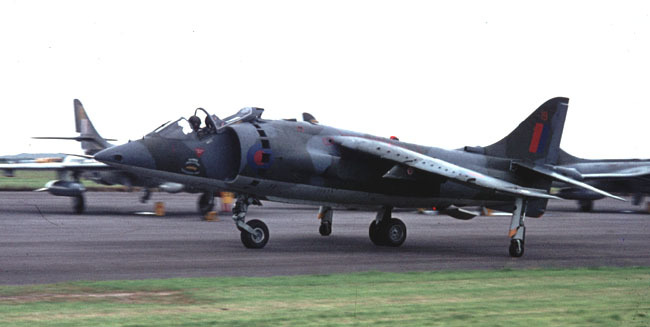 The GR Mk 5 was built around the Pegasus 105 engine with the new composite wing of much larger area and a revised forward fuselage and cockpit with much better visibility. Eight underwing and one underfuselage hardpoints allow the carriage of up to 9,200lbs of stores plus two 25mm cannon. The avionics includes a Litton ASN 130 inertial navigaion system, Hughes Angle Rate Bombing Set using both TV and laser trackers and Ferranti moving map display. 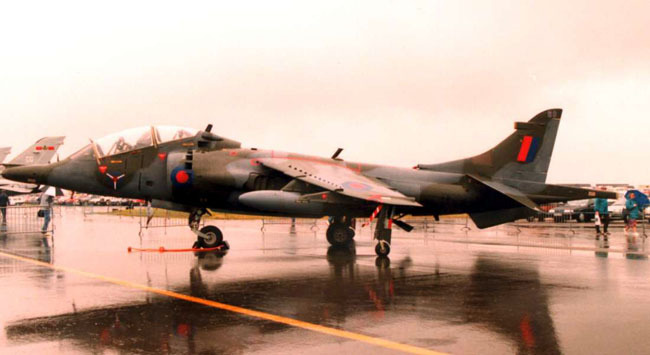 The prototype (ZD318) flew on 30 April 1985 and the new version entered service with 1 Sqn in 1988. There were several problems in introduction into service and in the event the GR5 was an interim type pending the GR Mk 7. GR Mark 5A The Mark 5A was similar to the GR Mk 5 but with fitments to GR Mk 7 standard. 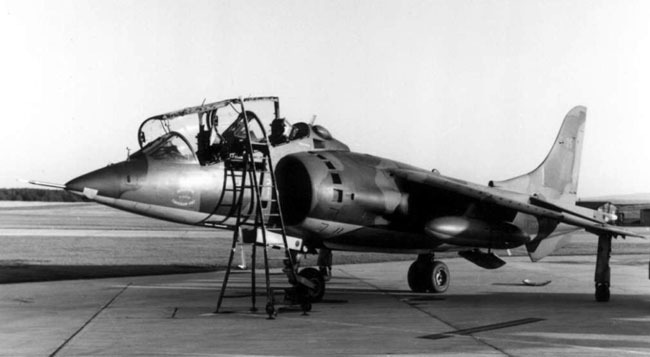 The airframes (nos 42-60) were placed in storage for full conversion later; the first was ZD432. T Mark 6 The Mark 6 was a proposal to bring the T Mk 4 to GR Mk 7 standard with night attack avionics; it was not pursued. 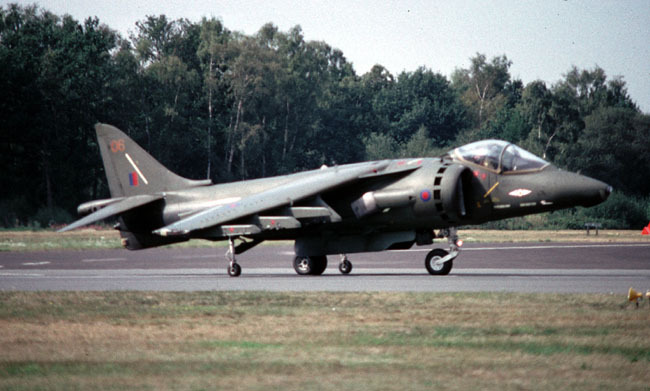 GR Mark 7 The definitive 'new Harrier' is similar in nearly all respects to the GR Mk 5 but with night attack capability. This results in a slight change in the nose profile to accommodate FLIR in a fairing above the nose, while two smaller bulges below the nose house the forward Zeus ECM antennae. The aircraft is effective at night through the provision of night vision goggle (NVG) compatible instruments. 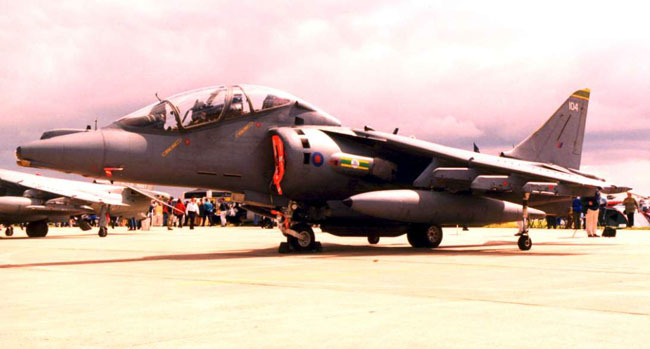 Nine aircraft have been wired for the Vinten camera pod used on the GR Mk 3 but with camera changes. 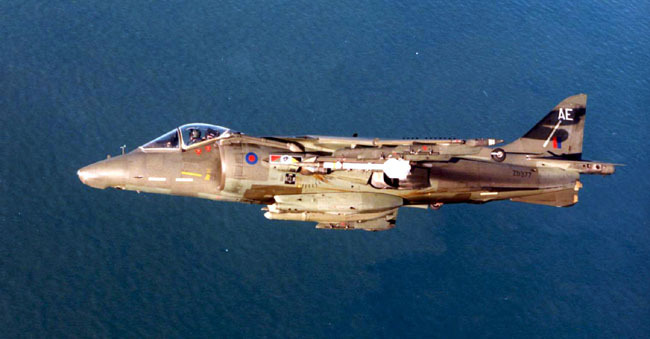 Armament remains as on the GR Mk 5 but with the Aden cannon still not operational at December 1994. T Mark 8 The Mark 8 is the designation for two T Mk 4 trainers transferred to the Royal Navy when the T Mk 10 became available to the RAF. GR Mark 9 This is the intended designation for the GR Mk 7 mid-life update with the Pegasus 11-61 (flown in ZD402 in 1989), terrain referenced navigation system and provision for the AIM-120. T Mark 10 The Mk 10 is a tandem trainer built to match the GR Mk 7. 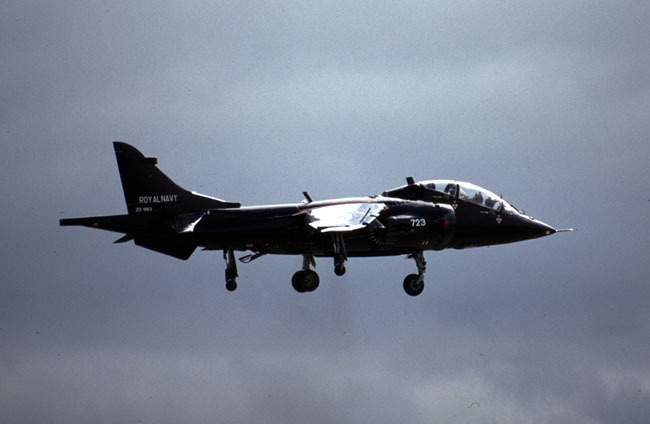 The variant is fully combat capable, unlike the American TAV-8B, and the prototype, ZH563, flew on 7 April 1994. That is fine as long as you credit me and put a link to my site. Let me know if you need any other photos and I may be able to help with scans.